Thought I’d post a website traffic report after reviewing my top social media posts of 2012. I hope my experience will give you some ideas for your own website! April 20, 2011 marked the unveiling of this current WordPress website. I went with WordPress because I knew that blogging was the way to attract traffic to your website. My intentions were good, but my blogging was inconsistent – in both topics and schedule. I finally hit my blogging stride in February 2012. A glance at my Google Analytics tells the story! I posted 72 times on this site last year, and that took me into the top 100,000 websites in Alexa rank, with an average 1,200 visits a day, by mid-November. Earlier, my typical traffic through mid-January 2012 was 1 to 12 visits a day. Quite simply, blogging works! Google loves sending traffic to sites with fresh content. The next spike (November 8 – 1,891 visits) was an influx of traffic from Facebook on a post about sharing photos on Facebook. Someone with a large fan base must have promoted that post on Facebook, as it got 784 views from Facebook in one day, and it normally takes me weeks to get that much traffic from Facebook! My traffic held steady through December, which I did not expect. I feel I’m poised for great things in 2013! How often do you check your traffic stats? 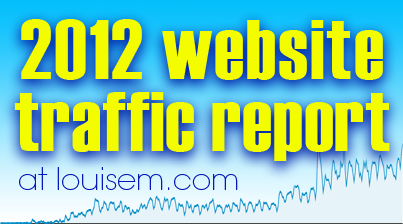 Have you ever done a website traffic report? Hi Sue, so glad to hear you enjoyed it! Happy 2013! Hi Louise – great to know about you! I have had a website with weebly for a little over a year and will be transferring to WordPress this year, first quarter. The one thing that I am sad about is losing all my prior blog postings. How did you handle your transition to WordPress? Did you have a blog postings that you brought over? Maybe a dumb question, but I have to ask. Thanks I appreciate it! Hi Pam, it’s actually a GREAT question. I didn’t have a blog before, so I don’t have any experience with the transition. I’d google it though. I would definitely want all my content on my new site, but you have to be careful of duplicate content. You might need to delete the old site for a time before adding the articles to a new one – I have no idea the best way to go about this! Pam, there are ways to import content into a WordPress website. I’m not familiar with weebly but google “importing content into WordPress” and you might find a way that will work for you. Romy, you are SO awesome! Thanks so much for your kind testimonial, amiga! I would love to become more savvy with analytical and understanding my stats. Good post! Found you via ultimate blog challenge. Great to meet you, Mercedes! Sarah, that’s great! I’m glad to hear that your traffic and interaction are improving with WordPress. I know blogging is a great way to boost traffic. One of the great things about this challenge is that it’ll set the tone for 2013 for me & I’d like to keep up with blogging something everyday. That’s awesome Toni! I’m glad to get to know you and your blog. Congratulations Louise! It’s all about consistency. That is my goal for 2013 as well. At least 3 posts every week. Thank you for sharing. Love your blogging. 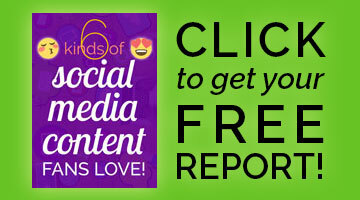 With your quality writing, 3 posts a week should bring you loads of traffic! Inspirational Louise. looking forward to getting my wordpress site up and running. That totally rocks! I am not surprised at all because you post very quality content on your site. Plus you are great about promoting it. I’d love to know in April and July where you had spikes – what attributed to the spikes? I’m thinking there was some other great strategy you had before the Emoticons article. That first big bump above “April” is actually the last 4 days of March, right before Timeline for Facebook pages became compulsory. I already had several articles about setting it up, and they were getting lots of traffic then! There’s another 4-week bump from mid-May to early June. I really can’t say why, maybe people trying to get Facebook pages in order before summer vacations. It was mostly the Fan Page posts I’d written in March that were getting the traffic. You can also see how my traffic consistently drops every weekend! I think this is a great post that really lets people know what it possible. It is also great motivation for us doing the 31 day challenge the difference blogging can make to your site traffic!! I’m happy to see how many have found this post motivational! Thanks for visiting Stacey. Best of luck with the blog challenge! That’s so exciting that things picked up for you so quickly. I’ve been blogging for almost a year an am lucky to get 15 views a day. Hoping this challenges ‘boosts’ that!! Best of luck with the challenge Crystal – blog on! I’m here from UBC and love this post. Very encouraging! I just wonder how to get those fantastic numbers on posts about skin care and aging. 🙂 My blog is new though. Published about 40 days ago. It can happen! Be sure to visit my post on basic SEO. That, plus jumping on any new stories in your industry, could do the trick. I will be honest; I have never done a full traffic report on any of my blogs or (former) sites. But I do know from the basic minimum report that Blogger has that people really like cat pictures (which is my number traffic drawer). You are an inspiration, Louise. I’m trying to resuscitate my blog, which I neglected last year. Your story will help keep me motivated. Thank you! Sue, thanks for visiting! I’m wishing you much success in 2013. I need help getting traffic. Any suggestions? If you’re in a competitive field and need quick results, you may want to consult with an SEO expert. You’re welcome Marie, I’m glad you enjoyed it.